There is no band biography on your official internet resources. Can you tell us about the beginning of Dusk? A product of Wisconsin's harsh winter climate is Dusk. Six months of overcast, sub-zero weather tends to bring out the feelings of desolate hopelessness. Dusk has chosen to channel these emotions into musical form. Mood, atmosphere and a sense of "groove" are combined into a mournful, aural experience. Dusk was formed in January 1993 by guitarists Steven Gross and Tim Beyer. Fed up with the brutal rehash that was infecting the death metal genre, Steve and Tim set out to create something fresh. The line-up was completed by Shimron Heemstra(ex-Bleed) on drums and bassist/vocalist Steve Crane. Live shows with bands such as Cannibal Corpse, Cynic, Morta Skuld, Morgue, Afterlife, Gutted, Broken Hope, Paralysis and Bleed have gone really well. The reaction has been fantastic from show goers and bands alike. 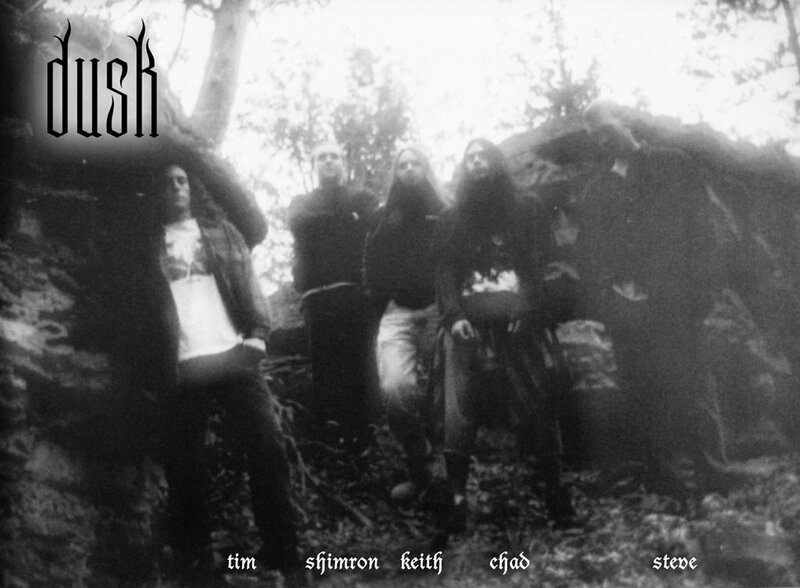 Dusk's self titled EP was recorded in December of 1993 with recording god Eric James. Co-produced by the band and Mr. James, they have embedded themselves into the soil of the underground. This EP shows the direction in which Dusk is headed. The Band`s first record is "Dusk" EP. It was released by Requiem Productions and Cyber Music from Netherlands, well-known for genre-forming and highly rated releases label. How did your band get into their roster? I think our other guitarist Steve Gross was the one in contact with them back then, he did most of the mailing and correspondense back in the day. There are mentions that before EP release there were demo and promo with identikal to EP track list. Is it the same record on demo and promo, that was released later as "Dusk" EP? Our demo EP is the same EP Cyber Music released, they distributed it worldwide for us. Dusk`s next record, "...Majestic Thou in Ruin" LP, was released in 1995 and it sounds different, comparing to earlier stuff. Was it a new approach to work on your music or was it just a natural way of things? In a way it was just a natural order of writing that we did, we already had some faster songs on the EP so we wanted some longer, slower and more ambient songs on the second release. Can you tell us something about Stephanie Reini, the girl who sings on the last LP track? Stephanie was our drummer Shimron's girlfriend at the time, they are no longer together. You also invited Tim Pantzlaff from Crawl, the band that was based in the same city with Dusk, to record cello for the album. What was your relations with other bands from area? Was there any kind of local scene? Yes, we had a great scene going for a while back in the day, all of the bands were great friends and hung out and partied with each other, there wasn't any competition, just all of us having a good time. "Dusk" and "...Majestic Thou in Ruin" (as well as records from your neighbours - Bleed`s "Womb" and demo Nothing Sacred) were released by Reqiuem Productions from Wisconsin. Can you tell us about this label and its part in the band`s past? Requiem Productions was an independent label made by our friend from Jason Dejardin from Bleed, it was just something to put on the cds. Sometime after album`s release, Steve Crane had left the band because of controversy with Steve Gross, as it mentioned on band`s old Myspace page. What was the reason of this controversy? First off, the band's MySpace page isn't even ran by any of us, it would be nice if whoever created it would get a hold of us, some of the information in it is wrong too. Steve Crane just simply left the band as he was going through his own life changes as everybody does at some time in their life, there was no controversy between anyone in the band. One of the most famous facts about Dusk`s biography is that Steve Crane became religious and had gone to Africa as a missionary. Can you describe your way into religion - what you were moved by, what experience did you get? Is there any contradictions between your faith and the things that you do as a Dusk member? Steve Crane leaving was just part of someone needing a change in their life and doing it, people sometimes go through changes in life, things change. As far as now, things are back to normal, it's like we're all back in 1994 with fresh new energy! We just concentrate on the music and the fun it is re-creating the songs and playing heavy music. We're all in better places now and have better means to focus on the band and better ways to handle life. After Steve had left the band, two new members joined it - Chad as vocalist and Keith as bass player. How did you find them? Was it difficult for them to became part of the band? Chad and Keith were easy to find, Chad was actually a big fan of the band, Keith was the bassist of Crawl and when they broke up he wanted to be a part of our project. It wasn't difficult, just different. Once I read in an interview that after Steve has left Dusk, the interaction between other members became weak and it was hard for the band even to stay in the room together. Can you tell us about those times? Nearing the end of the Dusk days it was just a feeling of not having that same feeling we did when the band first started, it just wasn't the same Dusk. "Visionaries of the Macabre", the compilation by Lost Disciple label, was released in 1998 featuring your last known song - "Yearning for Eternity". How did you get on the compilation? Was there any other contribution from the band to this label planned? This final chapter - was it significant for the members or the band was almost broken up by that time? Yearning For Eternity was a song written just to be on the compilation CD. What was the cause of the Dusk`s break up? There is no one reason Dusk broke up, we just stopped, we knew what we were doing didn't have that "it" factor like we knew we had when the band first started. None of us made money from the band so it wasn't like anyone was depending on the band to survive or anything, it was just time to take a break. In 2005 Cursed Productions released Dusk`s split with Aphotic. Your side was recorded in 1997 - why these songs weren`t released earlier and why you decided to release them after such a long time? We didn't release the third album right away because once it was recorded that was around the same time we were starting to think it was time to take a break. Dusk`s music, recorded with the new line-up, is different, comparing to the older stuff. Was it influenced by new members or just the way of the band`s sound developing? The new members didn't really influence the sound we were coming up with, they didn't really write the music parts (Chad wrote his own lyrics), it was just how Steve Gross's and my riffs evolved at that time. Is there any unreleased songs, sketches or all the Dusk`s stuff is on the CD`s already? We have a few unreleased songs and a bunch of ideas still recorded from old practices, we will be writing some new songs but first we're making sure we have all of the old songs we're going to play down really well first. As far as artwork I don't think there's anything from the past we have sitting around waiting to be used, we'll come up with something cool though for future stuff. 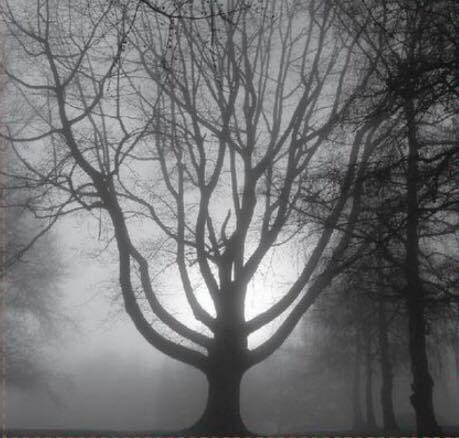 New wave of interest to the band was raised in 2014, with the announcement of remastered reissues of "Dusk" and "...Majestic Thou in Ruin" on Dark Symphonies\The Crypt. This version is similiar in general to the Lost Disciple compilation, but contains only songs recorded by original line-up. Is it concept of this reissue? And what about latest band`s material? Yes, the concept was to release the original music from the original line-up, as far as the 3rd release, I don't think we'll be pushing to get that re-released anywhere. A year ago you uploaded video of the band`s 1994 performances with songs from debut EP. Did you ever play shows with album-based setlist? Yes, we played songs from Majestic Thou In Ruin, there just wasn't good enough video of us playing those songs to upload to YouTube. There are images of nature in Steve Crane`s texts for your early songs. Was this theme significant for the band back in active years and what do you think about it now? How changed the approach to the lyrics with the line-up change? Nature themes are a big influence on all of us in Dusk, we would all take trips to the northwoods of Wisconsin to get our heads together to all be on the same wavelength which influenced our ideas, Nature is a very important theme for Dusk. There are long periods between band`s recordings, but the Dusk`s sound is easy to recognize. Except 1997 sessions, everything is recorded on Simple Studios with engeneering and production by Eric James. Can you tell us about his contribution to the band`s sound? Eric didn't help with producing, he just recorded us. What is the reason of Dusk`s original line-up reunion announcement? What plans do you have at this moment?